At Eastcroft Park School we strive to provide our children with a rich and broad curriculum within which all pupils can learn and achieve their best. The curriculum delivers the National Curriculum 2014 in an exciting and purposeful way. Each class will focus on a range of cross curricular topics throughout the year. Cross curricular links are made to make learning interesting and meaningful. Where content of the National Curriculum cannot be delivered through a cross-curricular approach, some discreet lessons or series of lessons may be taught. 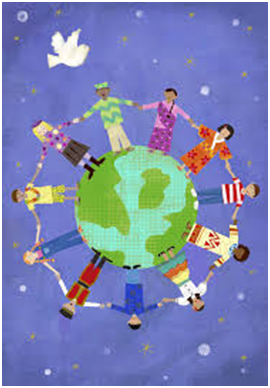 Throughout the year children will be involved in whole school topics which focus on specific subjects. During ‘Big Bang’ week children throughout the school are involved in Science Investigations and exciting experiments. ‘Step into a Book’ week will celebrate reading for pleasure and the children will be inspired by a variety of stimulating reading activities. ‘Let’s Get Messy’ is a week dedicated to exploring different art techniques and investigating the work of other artists. Each half term, time will be dedicated to the Eastcroft Park Pupil Passport for Life. Children will keep a personal record of their progress in the S.P.E.A.K. curriculum. Each half term parents will be informed of the focus of their child’s S.P.E.A.K. work to enable parents to support their child at home. For example children may be asked to learn a new skill such as to tie shoelaces or cook a healthy meal. The school will ensure that all children have the opportunity to experience a wide range of Cultural visits and events. The Eastcroft Park cultural entitlement is known as F.A.M.E. 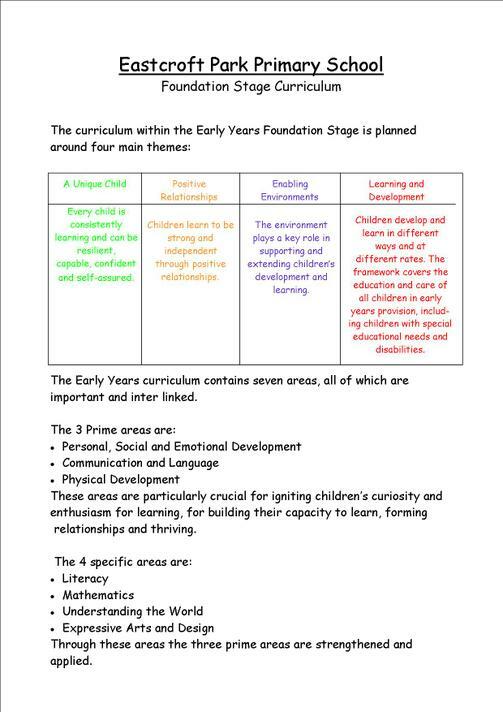 For further information about the Curriculum, please see the whole school curriculum planner, the subject statements below and the Year Group links for overviews for each year group. If you would like to find out more about the curriculum at Eastcroft Park, please contact the school direct or complete the enquiries section on the ‘Contact Details’ page of this website. At Eastcroft Park School we believe mathematics is an essential skill that provides your child with the necessary knowledge to equip them for both the world of work and further study. Maths enriches your child’s aesthetic and linguistic experience by providing them with the means of exploring and explaining both their own and wider environments through practical experiences and the development of logical thought. Each class in KS1 and KS2 is taught a daily mathematics lesson using the Singapore based Maths scheme Maths- No Problem!Maths -No Problem is a comprehensive series that adopts a spiral design with carefully built up mathematical concepts and processes adapted from the maths mastery approaches used in Singapore. The Concrete-Pictorial-Abstract (C-P-A) appraoch forms an integral part of the learning process through the materials developed for this series. In these sessions we hope to foster a love of maths by providing relevant, meaningful, engaging and enjoyable lessons. We aim to make mathematics interesting by encouraging confidence, curiosity and an enthusiasm for the subject through practical experience, oral, mental and written work. Pupils complete work in age related textbooks with consolidation and challenge activities being provided in their Maths journals/exercise books. Fluency and Basic skills knowledge is practiced throughout the week and children are encouraged to see the benefits of having secure timetables and fluency knowledge alongside developing their understanding of how this is applied across the maths curriculum. Homework is set on a regular basis to reinforce and consolidate objectives taught in class. Mathematics is a powerful tool for solving problems which can be applied to a variety of real life scenarios. It is an essential skill that is transferable to other areas of the curriculum, enabling children to further embed their mathematical understanding in the cross curricular environment that is encouraged at Eastcroft Park. Parental involvement is encouraged. We would like parents to have a clear understanding of the ideas, approaches and methods that we use to teach maths in our school. If parents have any questions about the way maths is taught they are welcome to contact their child's class teacher. Literacy is one of the core subjects in the National Curriculum. The ability to read and write are essential life skills which your child will learn during their time at Eastcroft Park. We pride ourselves on the high expectations and standards of teaching and learning during our Literacy lessons. A range of exciting, engaging and stimulating activities are provided from the Early Years through to Year 6, and encompass speaking and listening, reading and writing. Speaking and listening plays a key role in children’s development. Structured talk is an essential part of the school day and this enables children to clarify ideas and orally rehearse writing, which results in higher quality of work. Children are taught to speak confidently and clearly according to the audience and to listen to what others have to say. Stimulating role play areas are available in all year groups and are linked to the class topics. Teachers plan innovative ways to incorporate Speaking and Listening activities into lessons and children are encouraged to use the role play areas during free choice and wet playtimes. Each day children are involved in Social Snack time which encourages children to listen to and discuss thoughts/opinions and understanding across a wide range of topics. We promote a ‘Reading for Enjoyment’ ethos at Eastcroft Park. Reading is developed through shared, guided and individual reading, both within Literacy lessons and across the curriculum. Children in Foundation Stage and Key Stage One follow the ‘Letters and Sounds’ phonic based programme, which promotes speaking and listening, phonological awareness and oral blending and segmenting. We currently use the Oxford Reading Tree scheme including fiction & non-fiction. It also includes series such as phonics, treetops, traditional tales, project X and graphic novels. At Key Stage Two, children are encouraged to develop their skills in inference and deduction and analyse the use of author’s language to establish further understanding of texts. All children across the Key Stages follow a structured reading scheme and take home a variety of phonic based and other reading books to create a healthy balance, and children are expected to read their book every night. We are very lucky to have a brand new Reading Hut & Reading nook, with lots of new resources. Children look forward to time in the Reading Hut and use it to further enhance their love of reading. From Foundation Stage to Key Stage Two, writing is taught explicitly from using modelled and shared writing, supported composition, independent writing and writing across the curriculum. Children are taught to write with confidence, fluency and accuracy, and are continually given opportunities to write for a variety of different purposes and audiences. All children’s writing is highly valued, praised and purposeful. In Foundation Stage, children are immersed in a variety of shared writing, guided writing and emergent writing, promoting a value and purpose to their play. In Key Stage One children write more independently and are encouraged to think through their ideas and put them into written sentences using appropriate grammar and punctuation. Key Stage Two build on from this and children are expected to write independently, drafting and re-drafting their work, using a higher level of appropriate grammar and punctuation. Children in Year 1 to Year 6 take part in the ‘Big Write’ which allows uninterrupted time for extended writing in a quiet and calm atmosphere. Children prepare for the ‘Big Write’ over a 2 week period. Big Writing is usually inspired by the class topic which encourages writing across the curriculum. We also conduct ‘Big Write Events’ throughout the year where a high impact activity or event is planned to motivate whole school writing around a common theme. Recently we have focused on extending vocabulary and language acquisition in order to enhance the sophistication of our children’s word power. Each week children in all year groups are exposed to three higher level words and are encouraged to use them within day to day dialogue as well as having a positive impact on writing. We have found that children are more confident to articulate themselves accurately and with panache. Spellings and spelling rules are taught systematically across the school. In Foundation Stage and Key Stage One, spellings are predominately taken from the ‘Letters and Sounds’ programme, where children are largely encouraged to spell by sounding out words phonetically. In Key Stage Two, the focus lies more with spelling patterns and spelling rules. As well as dedicated Computing lessons during which children learn specific skills (such as word processing and using the internet), there are many more lessons in which Computing is used as a ‘vehicle’ to learn in other areas. This might be as simple as using a maths game to practise times tables, or something more complex such as entering data from a PE lesson to compare performances or creating green-screen films linked to weather across the world. We use a wide range of technology to embed Computing across curriculum including laptops, iPads, Macbooks & flipcams. We have adopted the Computing scheme of work produced by Knowsley CLCs which aims to combine computer science, information technology, digital literacy and digital citizenship & technology into a cohesive scheme of work. At Eastcroft Park school we ensure that the Science curriculum meets the requirements of the National Curriculum. Some of the Science programmes of study are taught through the cross-curricular class topics. Where links to topics cannot naturally be made then children will be taught science units through a series of discreet science lessons. As well as ensuring that children acquire the key knowledge and understanding of a scientific aspect, we also ensure that there is a practical basis to the science curriculum. This is designed to enable children to enquire, explore, observe, predict and then look for links and patterns in their studies. We aim for children to seek out information for themselves before recording ideas. They learn to devise and conduct fair tests and to draw tentative conclusions, using appropriate methods of recording. At all stages the children are encouraged to co-operate with each other in setting up experiments and attempting to solve problems. Children are helped to understand the contribution science makes to every day life and every effort is made to stimulate the child’s natural curiosity and desire to understand. ‘Big Bang’ week is dedicated to Science experiments and investigations. Children are given the ‘wow’ factor through exciting scientific starting points that are then developed throughout the week. The children are involved in challenging and exciting experiments to inspire Scientists of the future. The Geography passport has been developed to provide opportunities for the children to learn what we consider to be essential geographical skills and knowledge for life. Each half term children will engage in activities to support the acquisition of such skills and knowledge. The Geography Passport is a way for children to record their learning throughout the school. Geography is also taught through cross-curricular topics. At Eastcroft Park we provide a high-quality physical education curriculum designed to inspire all pupils to succeed and excel in competitive sport and other physically-demanding activities. Using part of the PE and Sport Premium the school school has invested in the Rising Stars - Champions PE planning scheme. This curriculum was chosen as it provides opportunities for pupils to become physically confident in a way which supports their health and fitness. We provide our pupils with opportunities to compete in sport and other activities, build character and help to embed values such as fairness, respect and team work. The document attached below provide an outline of the Physical Education curriculum at Eastcroft Park Primary School.